Metal stool with padded seat in a blue leather upholstering, Granvelaccio is a precious complement designed to furnish living rooms, bedrooms, bathrooms and hallways. Granvelaccio is a gold pouffe stool for living rooms, bedrooms or master bathrooms. It is characterized by the elegant structure in shiny golden metal with blue leather inserts matching the padded upholstered seat. Granvelaccio is a brass and leather ottoman, with an elegant structure in shiny polished metal topped by an upholstered seat covered in brown braided-effect leather. The pouffe stool with metal frame and brown leather seat Granvelaccio offers a luxury complement for high-end living rooms. To complete a sofa, as an extra seating or side table for books and magazines. 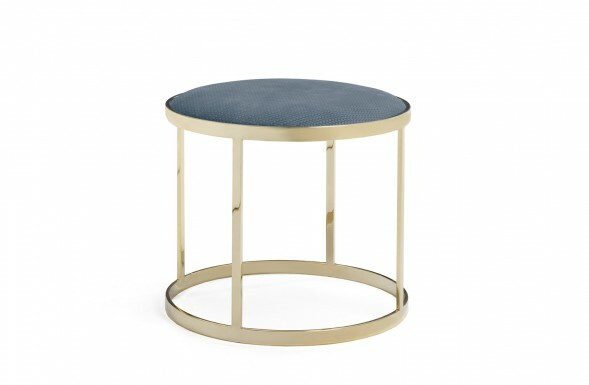 Granvelaccio is a metal upholstered small stool that can be used as a seat or pouf thanks to its sturdy metal structure in a polished gold look. The seat is upholstered in green leather. Granvelaccio is a sophisticated bedroom pouffe stool for an elegant interior, perfect as a bedside table or a seat in front of a makeup table, as well as a stool inside a spacious walk-in closet with a dressing room. Granvelaccio is a gold decorative stool with a round design and leather seat. The perfect accessory for refined living rooms, walk-in closets, desks and vanity tables, it makes for a multipurpose complement. Granvelaccio is a beige leather pouffe stool with golden metal structure and padded seat that allows it to be used as a stool or extra seating. An elegant addition with a thousand functions.